Dimension Films Picks Up Witches Ballroom Pit.. Shock Interview: Rob Zombie Goes Outside of H..
L.A.: See The Lords of Salem With Rob Zombie .. 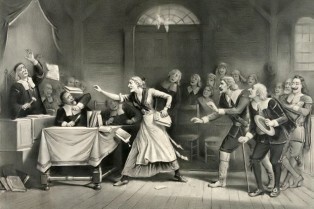 This year, witches, magic and magicians have been a running theme in movies, but so far, they’ve been used in a fairly tame way, so leave it to rocker turned filmmaker and recent author Rob Zombie to shake things up with The Lords of Salem, an insanely violent and trippy look at the return of the witches of Salem, Massachusetts bent on getting revenge for those that persecuted and executed them. It stars Rob’s wife Sheri Moon Zombie as rock DJ Heidi who receives a wooden box containing a vinyl record by a group called “The Lords.” Assuming it’s a promo, she plays it with her colleague Herman (Jeff Daniel Phillips) but the record starts playing backwards and suddenly, Heidi finds herself pulled into surreal and crazy situations involving a mysterious neighbor and a plan by the current witches of Salem to bring back their Dark Lords. ShockTillYouDrop.com had a chance to sit down with Rob for a video interview at this year’s South by SouthWest Film Festival in Austin and we were surprised to learn that he’d never been to SXSW even with his band White Zombie and it was only his second film festival for The Lords of Salem following its premiere at last year’s Toronto Film Festival. In anticipation of this month’s release, The Lords of Salem (review), Anchor Bay has released yet another clip from the next directorial effort from Rob Zombie. The film is opening in the following cities on April 19th: New York (and LI), New Jersey, Connecticut, Boston, Los Angeles, Boston, San Francisco, Chicago, Philadelphia, DC, Miami, Dallas, Houston and Detroit. More cities are expected to be announced. Over the weekend, I had the opportunity to finally see Rob Zombie’s latest feature film, The Lords of Salem, a tale of witchcraft in modern-day Salem that will surely divide horror fans – as most of Zombie’s films are wont to do. I dug it, however, and embraced its atmosphere, pervasive weirdness and Fulci-esque vibe. It won’t work for some, but I got what Zombie was going for. That said, stay tuned for a review. Also, check out the new clip inside – called “Beasts” – which finds star Sheri Moon Zombie encountering some creatures. The film opens on April 19th! Rob Zombie’s The Lords of Salem played to SXSW audiences recently and our own Edward Douglas was there to snap a few pics of the “variant” posters that were on display at the screening. Truth be told, they’re just this one-sheet but with different color schemes – check ’em out inside. Opening April 19th, the film is Zombie’s fifth feature film. Meg Foster, Ernest Thomas, Jeff Daniel Phillips, Torsten Voges, Bruce Davison, Billy Drago, Richard Lynch, Lisa Marie, Maria Conchita Alonso, Ken Foree, Barbara Crampton, Michael Berryman, Sid Haig, Judy Geeson, Sheri Moon Zombie and Patricia Quinn star. *Updated* – check out the clip inside! Entertainment Weekly in all of its “we don’t like our videos embedded” glory has posted a new clip from Rob Zombie’s The Lords of Salem. The film opens April 19th – for more on the film, follow this link where you’ll find videos, pics and more! Anchor Bay Films has released a clip from Rob Zombie’s The Lords of Salem, starring Sheri Moon Zombie, Jeff Daniel Phillips, Ken Foree, Bruce Davison, Dee Wallace, Meg Foster, Maria Conchita Alonso, Barbara Crampton, Michael Shamus Wiles, Ernest Thomas and Patricia Quinn. You can check it out after the break. From the singular mind of horror maestro Rob Zombie comes a chilling plunge into a nightmare world where evil runs in the blood. “The Lords of Salem” tells the tale of Heidi (Sheri Moon Zombie), a radio station DJ living in Salem, Massachusetts, who receives a strange wooden box containing a record, a “gift from the Lords.” Heidi listens, and the bizarre sounds within the grooves immediately trigger flashbacks of the town’s violent past. Is Heidi going mad, or are the “Lords of Salem” returning for revenge on modern-day Salem? 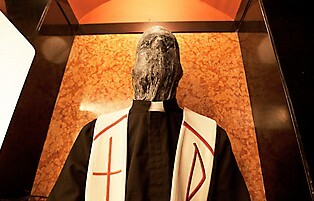 The Lords of Salem hits theaters in a limited release April 19th. “Strong bloody violence and gore, some sexual content and language.” That’s what got the official R rating for the Evil Dead remake, opening April 12th. 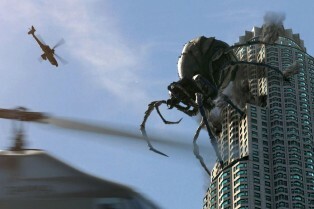 We ran a report yesterday stating that the MPAA slapped the film with an NC-17. Bodes well, because it means Fede Alvarez isn’t f**king around. But it also means that he had to make some cuts to get an R rating so the film could be released. As I said, expect a bloodier director’s cut on Blu-ray at some point. Rob Zombie revealed a new “blue” teaser poster for The Lords of Salem, opening April 26th from Anchor Bay. With the image, he revealed that the official trailer hits this week, so keep your eyes peeled to ShockTillyouDrop.com for that soon. Check out the poster inside. The big question a lot of folks have right now is: Will the release go wide? Anchor Bay hasn’t quite revealed those details yet. One would think that the company would roll the film out in a big way, however, it may go “limited theatrical/VOD.” As soon as we receive confirmation, we’ll let you know. The synopsis in case you’ve missed it: Heidi Hawthorne is a thirty-seven-year-old FM radio DJ and a recovering drug addict. Struggling with her newfound sobriety and creeping depression, Heidi suddenly receives an anonymous gift at the station-a mysteriously shaped wooden box branded with a strange symbol. Inside the box is a promotional record for a band that identifies themselves only as The Lords. There is no other information. The film is due April 26th from Anchor Bay Films. For all of our past stories, pics and more – click here. You can find the early teaser inside. 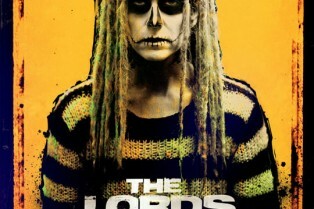 This week, we learned Rob Zombie’s The Lords of Salem was going to hit theaters on April 26, 2013. In the wake of that news, the writer-director has released a new behind-the-scenes photo featuring Zombie, Michael Berryman and Sid Haig. “Here’s a shot of some witchy business from THE LORDS OF SALEM,” writes Zombie. Check out the pic inside. Rob Zombie has penned a novelization for his upcoming 2013 release The Lords of Salem. He took on the task with scribe B.K. Evenson. The novelization is said to present a “different” experience, going deeper into the film. Grand Central Publishing is releasing the tome on March 12, 2013 in anticipation of the film’s April 26, 2013 release. Anchor Bay picked up the film out of the Toronto International Film Festival.